A brand new fully tweakable delay designed by Jeorge Tripps that combines the Aqua Puss and the Echo Puss to make the ultimate delay. At the 11:47 mark, on his left, the Supa Puss can be seen. "We did some Way Huge SUPA PUSS mods for Trey in 2015, as the BLEND on them comes up too fast, he just wanted a little delay so we found a mod to make it easier to dial in." At 6:58 in this rig rundown, Troy says "So I'm using also this Supa-Puss delay, just for, you know, if I want to get nutty for a second. It get's really extreme." "For amps, we used a Marshall YJM plexi 50w mode bridged over and all knobs pretty much on full. We used the MXR Carbon Copy Analog Delay and the Phase 90. For leads, I used an MXR Micro Amp + to get extra juice, and we also did a lot of experimenting with the Way Huge Supa-Puss Delay, which lets you distort the feedback. That created some really cool psychedelic stuff. For strings, I used Dunlop Electric 10-52s, and for picks, I used 1.5mm Tortex Sharps." "The audio of that movie routes through filters, envelopes, a Strymon DECO, a Strymon Timeline, or Dig, an Industrialectric Echo Degrader, a Way Huge Supa-Puss, which is one of my favorite delays ever, a Strymon Blue Sky, a Mr Black Eterna Gold, and an RML Fuzz." In this video at 12:20, Fluff shows off his entire pedalboard. He and Jared Dines then start joking about the name "Supa Puss," which is quite humorous. "This week I got two Way Huge pedals: the Saucy Box overdrive and the Supa-Puss analog delay. I put both of those on there with the Spruce Effects Salt Water Fuzz and the Levitation reverb by Earthquaker. Of course, my Boomerang looper is also on there." In this photo, Fluff's pedalboard is shown, and the Way Huge Supa-Puss pedal is visible. 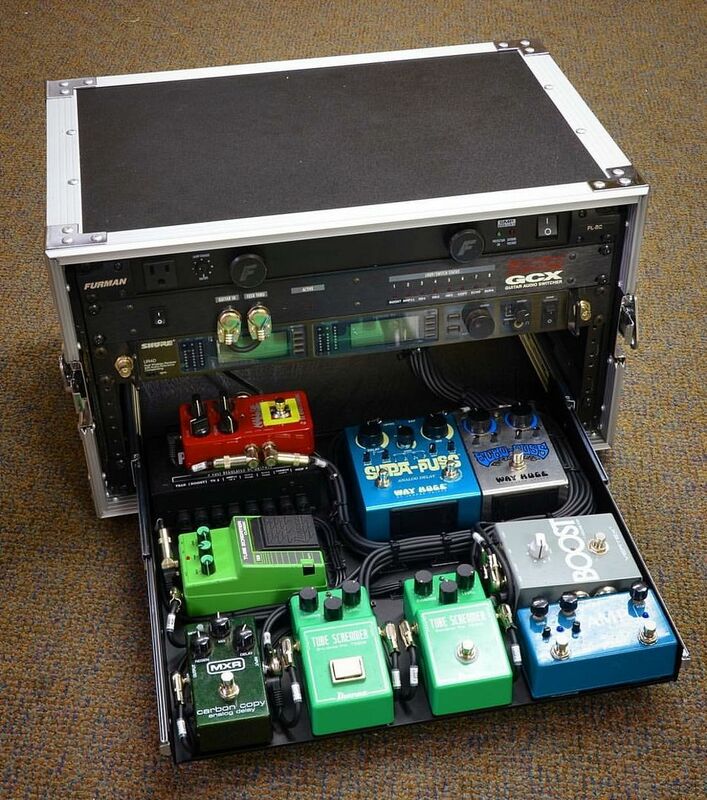 In this pedalboard photo posted by Shanks on his Instahram profile, we can see the Way Huge Supa Puss pedal. What's On Tim Pierce's Session Pedalboard And How He Get's Sounds. Yvette have Supa-Puss pedal on her pedalboard. Can be seen on his board in the top left. In addition to standard Delay and Feedback controls, Tripps included several controls for fine-tuning the sound of your repeats: Tone for shaping color, Gain for adding grit, and Speed and Depth controls for adding shimmering, liquid textures with the Supa-Puss' LFO modulation circuit. For even further tweakability, Tripps added a true Mix control so you can set your desired blend of wet and dry signals. Finally, the Supa-Puss has an expression pedal jack so you hook up an expression pedal for continuous, real-time control over the Supa-Puss' delay time.